In the past, some pediatric experts have claimed that formula feeding babies can experience deleterious effects upon their health and development. Such news can be very discouraging for mothers with breastfeeding complications or those who must return to the workplace shortly after their baby's birth. When it comes to the issue of formula feeding babies versus breastfeeding infants, there are many factors that come into play. Most importantly, it is vital for a mother's emotional health that she feel supported in her decisions, and that her decisions be weighed against both the data and her abilities. There are clear advantages for fomula feeding babies, the first of which takes into account the fact that breastfeeding is not always easy. Formula fed babies can more easily be transitioned onto a feeding schedule as it is inadvisable to administer a bottle more often than every three to four hours. Moreover, for mothers who are nutritionally deficient, formula may actually provide a more rounded source of nutrients than depleted breast milk. Iron is one particular mineral that can be deficient in a mother's milk. This mineral is almost always included in infant formula in order to build up a child's iron stores. Breastfeeding mothers may feel shy about feeding their child in public; whereas formula can be mixed on site and administered to the infant without incurring timidity. 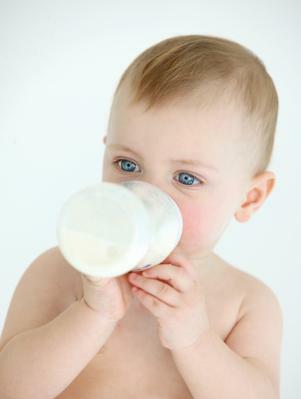 When a child is bottle-fed a formula, it is also easier for parents to keep track of just how much liquids their baby is ingesting. Some mothers simply cannot breastfeed due to a compromised milk supply. These mother may suffer great anxiety under the care of commanding lactation consultants who simply won't quit the fight, but there are cases in which a mother simply doesn't produce enough milk. The infants involved will experience poor growth until formula is administered. Also, mothers with multiples may find that breastfeeding doesn't meet the immediate needs of their infants. Formula can be an absolute godsend in such cases as it promotes an organized feeding schedule and ensures that each infant receives proper nutrition. The above cases represent the considerations of many mothers who have debated within themselves the idea of whether to breast or formula feed their child. The benefits of breastfeeding have been widely hailed by pediatricians through the last few decades. There is no question as to the medically documented advantages of breastmilk when it comes to issues like immunity and probiotic activity, not to mention the sensitivities an infant may have to the ingredients in commercial formulas. Breastfeeding is nature's intended medium for infants, and it may even affect the psychology of the child. However, there have been generations of American children for whom breastfeeding was not promoted. The 1940s and 50s marked an era where breastfeeding was largely swept under the rug as it was considered outdated, animalistic, and unsophisticated. With all the incredible benefits touted regarding breastfeeding, it is a wonder that such formula fed generations did not produce ill-developed sickly children with allergies and low IQs. This was not the case. Some mothers are led to believe that their formula fed infant will not receive adequate nutrition, that he will grow to become obese, unmotivated, highly allergic, and maybe even inferior to his breastfed peers. Again, this is not the case. There are many brilliant, well-adjusted formula-fed children that grow up to be equally well-performing adults. Moreover, there are many breastfed infants who develop food allergies even during the breastfeeding process, such that a mother must compromise her diet significantly in order to abate her infant's reactions. Also, the immunities imparted to a breastfed infant tend to wear down after a period of one year. Children who are fed organic formulas and are introduced to a well rounded diet of organic whole food solids will likely continue their good nutritional habits and develop both strong and healthy systems. For mothers who must formula feed their baby for a variety of reasons, it is important to remember that this feeding medium is not the coffin lid on their child's future. Finding a formula that works for your child and administering the formula at reasonable intervals may render its own list of advantages in the long run.